Paloma Beach is an attractive development of 230 self catering holiday apartments in Los Cristianos on the coast of south Tenerife. Built around a large pool area, private gardens and sun terrace Paloma Beach offers guests a tranquil haven for sun and relaxation ideal for your Tenerife Holiday. The pool is heated in the winter months. The apartments are built to four levels with lifts and stairs to all floors, one and two bedroom apartments are available with views of the private pool, tropical gardens or Atlantic Ocean. 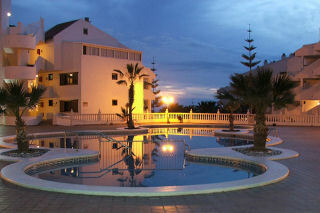 The accommodation is furnished to a high standard and all the apartments are privately owned. Paloma Beach has a well run and well stocked poolside bar serving drinks and food throughout the day. There are also plenty of bars and restaurants serving a variety of cuisine and offering light evening entertainment. Paloma Beach is located just 100 meters from the Sea and a pleasant 15 minutes stroll from the busy town centre of Los Cristianos, furthermore, two world-class beaches are within a 15 minute walk. There are plenty of sun beds available (2 euros per day) for guests to soak up the sun and relax by the pool, spend a peaceful afternoon on their private terrace, wine and dine at one of the many local restaurants, or explore the vibrant, yet not overwhelming Los Cristianos town centre. Transport from Tenerife South Airport to Paloma Beach is easy, there is a taxi rank outside the airport, catch a cab and ask for Paloma Beach Los Cristianos. The fare should be no more than 20 Euros. If you're hiring a car then the route from Reina Sofia Airport to Paloma Beach is simple, get onto the motorway (autopista) and follow the signs for Los Cristianos (it's about 20 minutes drive). Follow this link for a map of Los Cristianos. If you're looking for a game of golf while you're here then Paloma Beach is ideal. Central to 5 quality courses all within 15 minutes of the complex. There is a laundrette next to the reception. 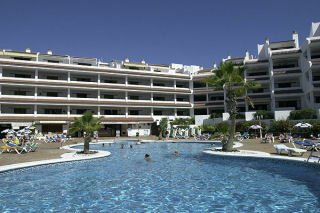 Paloma Beach has an established reputation for a high standard of self catering holiday apartments in Tenerife. Built to four levels and with lifts and stairs to all floors. There are one and two bedroom apartments available for holiday rentals all year, as well as a limited number of Penthouse (Top Floor) Apartments. A small selection of penthouse (top floor) apartments are available for rent. All the holiday accommodation have a spacious lounge and are comfortably furnished with a two or three piece suite. Satellite TV is installed with up to 7 English Speaking Channels (under normal circumstances). We can't guarantee the availability of any particular channel, but they normally would include BBC1, BBC2, ITV, Channel 4, Sky News, Sky Sports 1, Discovery, Sky One, Uk Gold, Movie Channel. Patio Doors open onto a large private terrace with patio furniture for those who wish to eat outside while looking onto the pool or gardens of Paloma Beach . The fully equipped kitchen includes an oven, hob, microwave, kettle, toaster and ample cutlery and crockery. The kitchen is normally separated from the lounge with a breakfast bar. All the holiday accommodation has good sized bedrooms and feature built in wardrobes with plenty of hanging and shelf space. Most apartments have twin beds and matching furniture. Bathrooms are fully tiled and have a bath/shower, WC and wash basin, hot water is provided by the apartment's own individual electric water heater. All linen including towels, sheets etc. are supplied and changed on a weekly basis. With an additional towel change every 3 to 4 days (Note: Please bring your own Beach Towels). As all the apartments are privately owned guests may find features and home comforts that they may not expect to find in ordinary Tenerife holiday apartments. Surcharges: Infants under 2 years are charged for cot hire only (£15 per week). There is an additional charge to pay if booking a penthouse (see below).